Whilst I’m on the topic of sauces for steak, I thought I’d give a homemade Béarnaise sauce a go. It’s my absolute favourite sauce with steak but I’ve always bought this rather than try and make it myself. I have to be honest – it was not smooth sailing. The first batch split. The second batch also split! But by this point I had no time to try again, so did a bit of googling and found a few methods of how to rescue a split Béarnaise. One worked! So whilst it was a very stressful kitchen experience, I’ve learnt a few valuable lessons. I recommend having your pan of water barely simmering – too much heat and it’s game over. It just needs to warm the bowl up enough to allow the butter to melt. I would argue it is worth making your own Béarnaise – it does taste fantastic, and I reckon with a bit of practice it won’t be too much of a faff. So the recipe is below, and then the rescue remedy that worked for me in case you have the same issue! Put a quarter of the tarragon into a small saucepan with the shallots, peppercorns, vinegar and water. Bring to a bubble and then reduce until the liquid is 1 tbsp worth. Heat a medium saucepan with 5cm water until simmering. Put egg yolks in a bowl sat over the water (make sure the bowl doesn’t touch the water), strain the vinegar mix into the yolks and whisk lightly to combine. Whisk in the butter, cube by cube. Only add the next cube of butter when the previous one has melted fully into the sauce. Keep an eye on your water temperature, do not let the mixture split. Keep going until the sauce is thick and glossy. When the last of the butter goes in, add the remaining tarragon. Serve immediately if possible, although this will rest for 30 minutes off the heat but still over the hot water. How to rescue a split bearnaise sauce! There’s a few options. The first is to take off the heat, set the bowl in about an inch of cold water, add 1 tbsp of cold water to the mix, and whisk rapidly. Take the mixture off the heat and set on an angle to allow the oily mixture to be drained off the egg mix (make sure you retain BOTH bits!). In a fresh bowl add 2 tbsp of water. Then add the egg mix 1 tbsp at a time, whisking rapidly to create a smooth mix. Once all the egg mix is incorporate, start adding the drained off oil, one tbsp at a time – each time making sure the mix is fully incorporated before adding the next batch. If you had any butter still to add (and I did, mine split around the halfway point! ), start adding again as before, and put the bowl back on top of the simmering water. But be even more aware of temperature – keep it warm enough to melt the butter and no more. Categories: Misc, Reidbury Recipes | Tags: bearnaise, rescue, sauce, Steak | Permalink. The other Sunday I wanted to do a proper roast dinner, and I tend to play it safe and do a roast chicken. I’d like to think that’s a speciality of mine. But I read this recipe in the January 2014 edition of Delicious Magazine for Slow-Roast Beef with a Pepper and Rosemary Crust and Guinness Onions. The fact it was slow-roasted appealed to me and I thought that, despite this being quite a large cut of meat for 2 people, topside is quite a lean joint and it’d do for leftovers. Which it did! 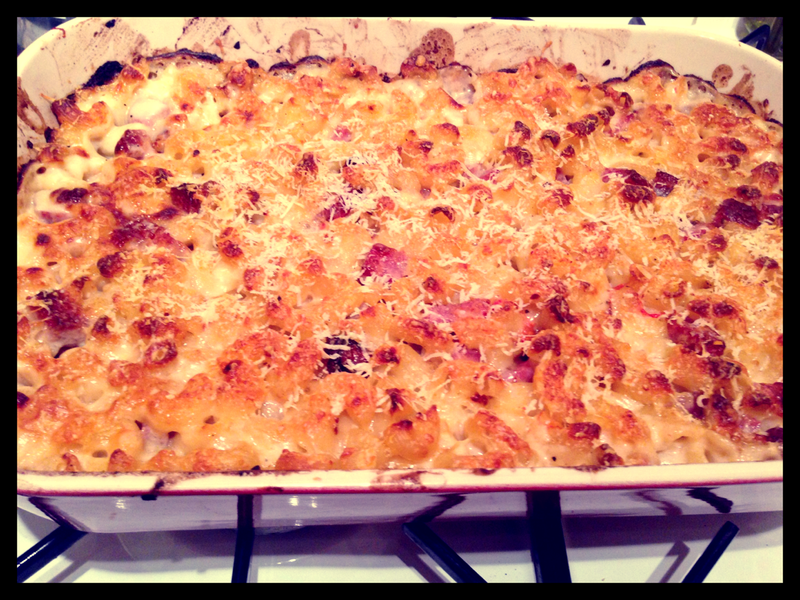 Brilliant on sandwiches, and brilliant as leftovers with the leftover Dauphinoise potatoes I made. 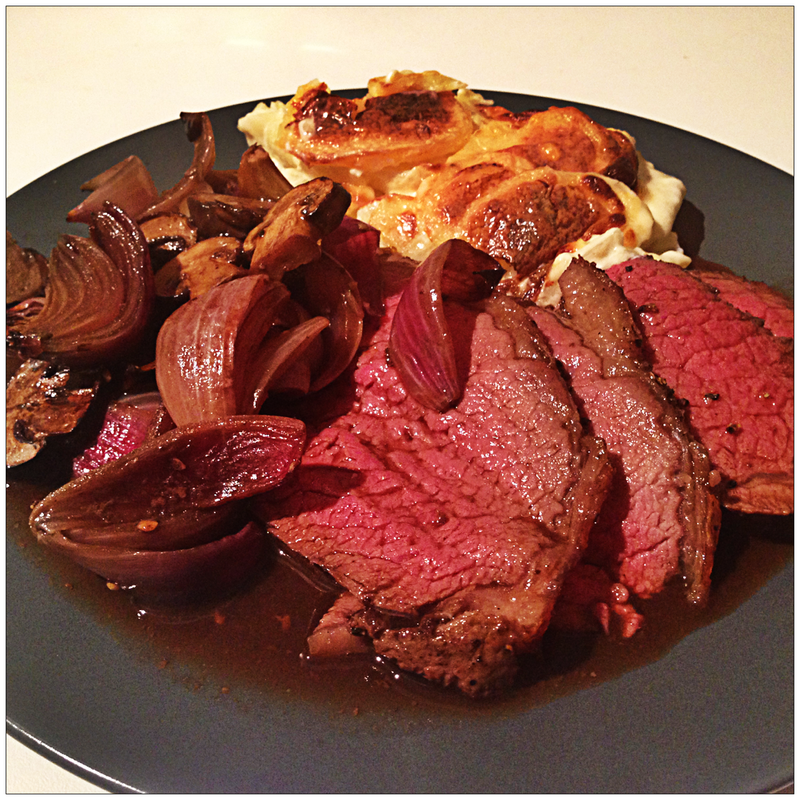 The beef itself was fantastic – probably the best beef dish I’ve ever cooked. And I will definitely be cooking the beef again. I bought a meat thermometer recently, and highly recommend getting one if you want to avoid the gamble of when to take the joint out of the oven. I also bought an oven thermometer (given an unfortunate incident with slow roast pulled pork that got incinerated – turns out the oven in this new house runs 30 degrees hotter than it says!). The reason I mention both of these things is not to show off. But to prove to you that I cooked everything to the right temperature. So you can imagine my disappointment that the onions were raw and practically inedible. I seriously cannot get my head around how they can possible cook and go ‘sticky’ as the recipe suggests at such a low, slow cooking temperature. And you can’t really turn the oven up, otherwise the beef will not cook correctly. My advice – cook this beef immediately, but don’t bother with the onions if you’re going to follow the recipe verbatim below. I’m trying to think of way of perhaps pre-sauteeing the onions to send them on their way, before putting them under the beef joint and getting the lovely cooking juices to add to the Guinness and making a gravy. 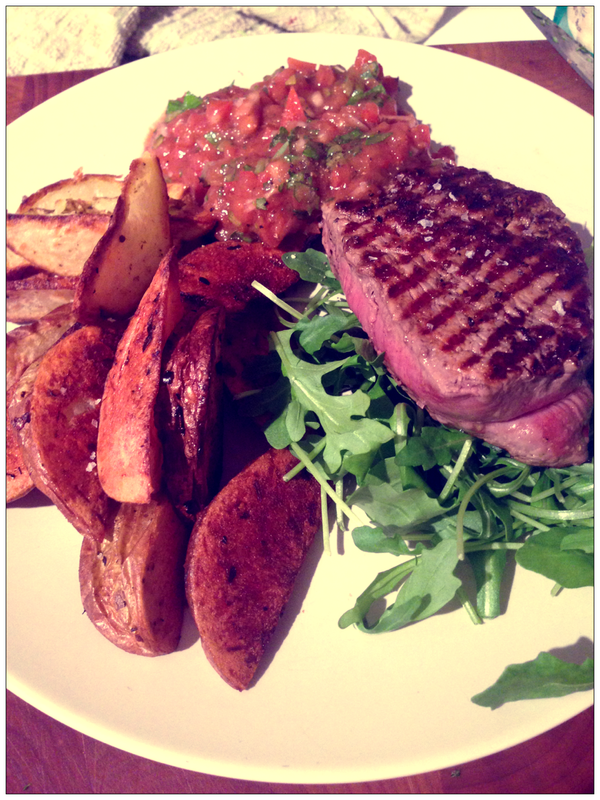 Finally, we like our beef rare – hence the pinkness in the picture! But apparently topside is best served rare to medium-rare, and slow cooking will always keep it pink. Just a pointer, in case you like your meat well done (in which case, I am judging you)! Preheat the oven to 180C/160C fan/Gas 4. Season the beef and rub it with oil, then put it in a roasting tin and roast for 15 minutes. Meanwhile, pound the pepper, salt, rosemary and olive oil in a pestle and mortar to a coarse paste. Remove the beef from the tin, then coat it with the paste. Turn the oven down to 100C/80C fan/gas ¼. Put the onions, mushrooms, garlic cloves and bay leaves in a tin, then put the beef joint on a roasting rack on top. Pour the Guinness and half the stock into the tin, then return to the oven and cook for 1.5-2 hours, adding more stock if the vegetables look like they’re drying out (see above comments – the Guinness didn’t even heat up let alone evaporate! But I’m leaving this recipe exactly as listed so you can make your own choices, or in case I messed up somehow)! Once the beef is cooked to your liking (a thermometer pushed into the middle should read around 55C for rare, 65C for medium), remove from the oven, transfer to a board and rest somewhere warm for 30 minutes wrapped loosely in foil. Strain the onion mixture from the tin. Keep the onions warm and pour the juices into a saucepan. Heat the juices until bubbling. If you want more gravy, add the rest of the stock along with more Guinness if you fancy. Slice the meat thinly, then serve with the onions and a splash of gravy. 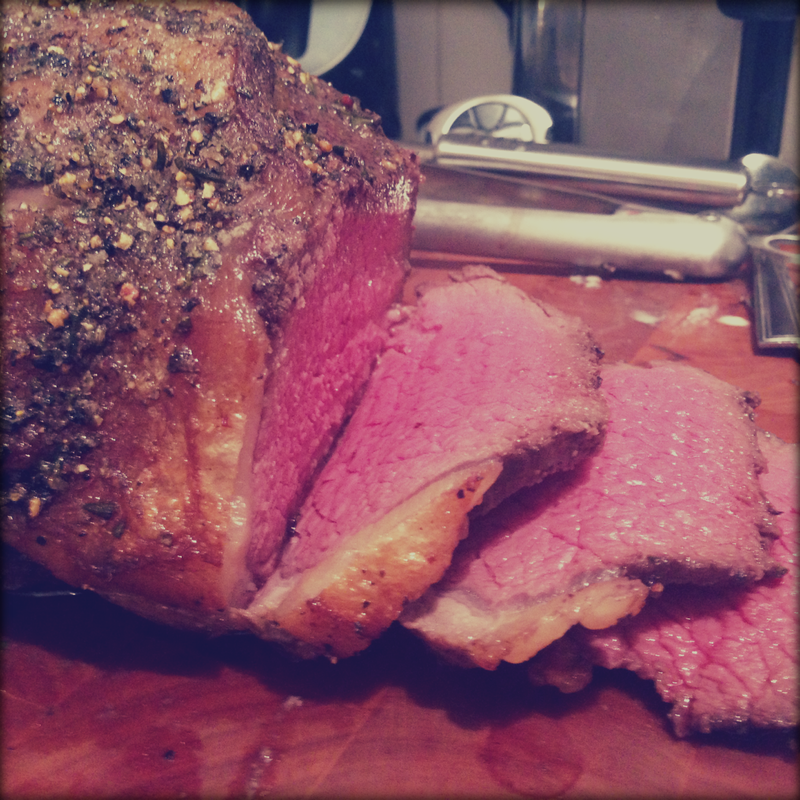 Categories: Cow, Reidbury Recipes | Tags: autumn, Beef, Delicious January 2014, roasts, Sunday, winter | Permalink. Two wonderful things have happened recently (in addition to buying the house! ), and I’m a very lucky and happy bunny. I was bought a Kitchen Aid, and I was also bought Nigella’s ‘How to Be a Domestic Goddess’ book. So I’m re-finding my baking mojo. 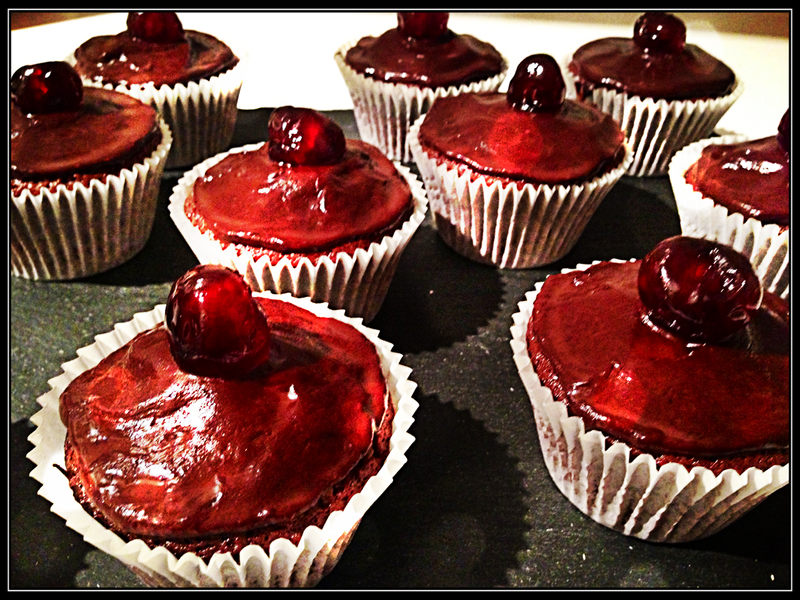 One of the loveliest things I’ve made recently are out of the Nigella’s book (buy it here – it’s ace) – Cherry-Chocolate Cupcakes. Easy to make, easy to eat! They’re a bit like a reverse cupcake, in that the cake itself is quite sweet, but this is perfectly offset by quite a bitter icing. You’ll notice a sneaky third score below. Guest judge, Chris, who was given the honour of Paul finally sharing my baking with someone other than himself! Scrape and pour into the muffin papers in their tin and bake for 25 minutes. Cool in the pan on a rack for 10 minutes before turning out. When the cupcakes are cool, break the chocolate for the icing into little pieces and add them to the cream in a saucepan. Bring to the boil, remove from the heat and then whisk, by hand or electronically, till thick and smooth. Ice the cupcakes, smoothing the tops with the back of a spoon, and stand a cherry in the centre of each. Categories: Cakes & Baking, Reidbury Recipes | Tags: Cake, Cakes & Baking, chocolate, cupcakes, How to Be A Domestic Goddess, Nigella Lawson | Permalink. The only good thing about the weather here in the UK at the moment is the opportunity to indulge in comfort food. Macaroni and cheese is a wonderful combination at the best of times, but the addition of chilli and salami just tipped me over the edge! I actually had been up for making mac n cheese since I had something very similar at Pizza Express recently that had Nduja sausage melted into it. God, it was good. 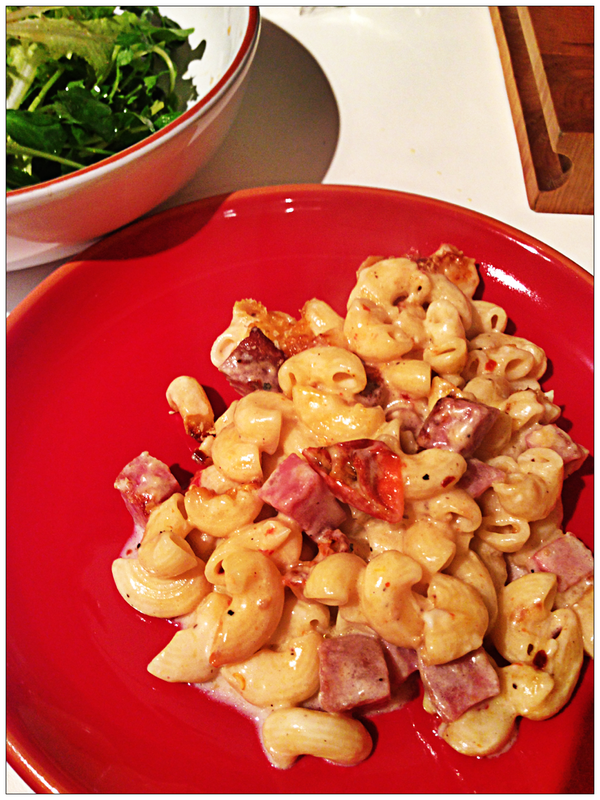 So I was hoping I could recreate the chilli, meaty kick by following this Creamy Macaroni Bake with Salami and Chilli recipe in ‘What Katie Ate’ by Katie Quinn Davies – buy the book here. When I made this I was a little concerned that the creamy sauce seemed very thin, but it did end up working out as it should – so don’t be afraid. I also recommend getting salami from the deli counter so it’s in one piece and you can cut it up into good sized chunks (rather than spindly little slices), and definitely roast the tomatoes as per the recipe. The sweetness that they add to this dish was a perfect addition! And the recipe says it serves 6 – and it’s a pretty whopping portion size, so it’s certainly a great dish to cook for a crowd. Preheat the oven to 160C fan, 180C, gas mark 4. Place the cherry tomatoes on a baking sheet, cut-side up. Drizzle with a little olive oil and season with salt and pepper, then roast for 30-40 minutes. Remove from the oven and set aside, then increase the oven temperature to 180C fan, 200C, gas mark 6. Half-fill a large saucepan with salted water, add a glug of olive oil and bring to a rolling boil over a high heat. Add the macaroni and cook for 8 minutes until just al dente (the pasta will continue to cook in the oven, so don’t overcook at this point). Drain and rinse under cold water, then transfer to a large heavy-based casserole dish. Add another glug of oil and stir to coat the macaroni evenly, then add the salami and roast tomatoes. Stir again and season with a little salt and lots of pepper, then set aside. Melt the butter in a medium-sized saucepan over a medium heat. Add the flour and whisk until smooth, then cook for 2 minutes, stirring constantly with a wooden spoon. Reduce the heat a little, then gradually add the milk, stirring constantly until the sauce has thickened and is smooth and creamy. Remove the pan from the heat. Add the Parmesan, pecorino, nutmeg, dried chilli flakes, cream and truffle oil (if using), and season with a little more pepper. Mix together well, then pour over the macaroni mixture in the casserole dish, along with the white wine, and toss to coat well. Stir through the basil leaves, then scatter a generous amount of extra Parmesan and pecorino over the top. Bake for 30-40 minutes until bubbling, golden brown and crispy (if you like, place the dish under a hot grill for a minute or two to get an even crispier topping). Serve piping hot with extra grated Parmesan, crusty rolls and a green salad on the side. Categories: Pig, Reidbury Recipes | Tags: autumn, comfort food, Pasta, salami, winter | Permalink. Not so long ago I was in a homeware shop that had a LOT of cookery books on sale. And whilst I know you’re not supposed to, I totally judge books by their cover. This lovely looking book was buried in the pile and then as soon as I read the title I knew that it was fate – the book is ‘What Katie Ate’! Flicking through it in the shop I then noticed every single page I landed on contained a recipe I really wanted to cook. So, there it is. Fate was sealed. Book was in the trolley before you could say ‘seriously, another one’. The book really is lovely (available to buy here and her website is here) and I’ve been looking forward to trying some things out. I started with her Mocha Chocolate Mousse with Irish Whiskey and the reason I put the last bit in brackets in the post title is because I chose to switch out whiskey for rum (which the recipe does suggest). I love whiskey, but Paul isn’t keen so I went with the alternative. 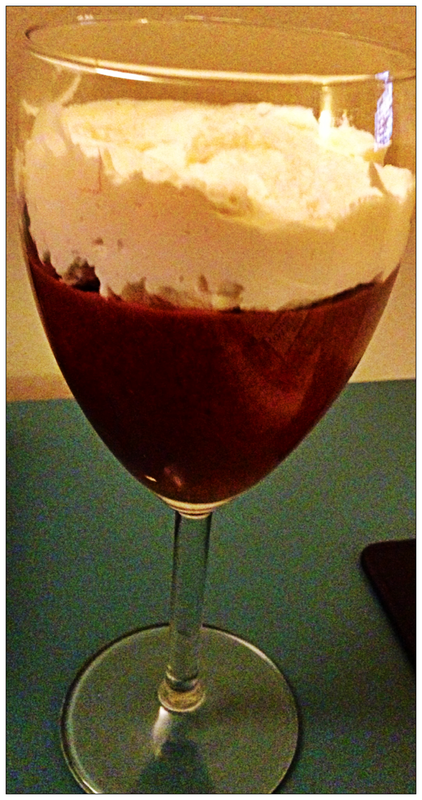 This mousse was lovely – nice and light and the mocha flavouring was a good touch. I did end up using practically every bowl I owned though, as you need to create a bain marie and use it with two different mixes. And then have another bowl with iced water and a final one to whisk the egg whites in. But otherwise, pretty straightforward to make and really good to eat! Bring a medium-sized saucepan of water to a gentle simmer, and melt the chocolate, butter and coffee in a heatproof bowl that fits snugly over the pan but doesn’t touch the water. Stir occasionally. Remove the bowl from the heat and set aside. Keep the water simmering away. Place a few handfuls of ice into a large bowl and half-fill with water. Set aside nearby. In another heatproof bowl that fits over the saucepan of simmering water (and will sit inside the bowl of ice water), add the egg yolks, caster sugar, whiskey/rum and 1 tablespoon cold water. Using a balloon whisk or hand-held electric beaters, whisk for about 3 minutes until the mixture thickens, becomes paler and has a similar consistency to runny mayonnaise. Remove the bowl from the heat and place it in the bowl of iced water. Continue to whisk for a further few minutes until the mixture thickens and cools slightly, being careful that no water gets into the mixture. Add the chocolate mixture to the beaten eggs and stir to combine. Whisk the egg whites with a pinch of salt until just stiff and frothy. Add the extra tablespoon of caster sugar and beat again until just glossy. Using a large mixing spoon, add one spoonful of egg whites to the chocolate mix and fold in gently. Gradually fold in the remaining egg whites, taking care not to overmix. Transfer the mousse to a jug, then pour into individual serving jars or glasses. Chill in the fridge for 3-4 hours before serving. Top with a thick layer of whipped cream to serve. Categories: Desserts, Reidbury Recipes | Tags: Booze, chocolate, cream, dessert, mousse | Permalink. I mentioned previously that due to the lack of fridge space (and the complete absence of a freezer), we’re having to shop every few days for food rather than once a fortnight like we’re used to. So the other day I noticed I had a lot of potatoes left over, and decided to buy some leeks so that they could be used up in a Leek and Potato soup. And then, by the time I actually got around to making the soup, the potatoes had gone green (and I’ve read they’re poisonous like that). So I then had some leeks that needed using up… I felt this might go on for some time, but then I saw a recipe in a great book called ‘A Soup for Every Day’ by the New Covent Garden Food Co for Asparagus, Leek and New Potato Chowder. You can buy this here and it’s currently a fiver on Amazon. I had all the ingredients apart from asparagus which I picked up for the purpose. However, I only picked up 100g and the recipe (I realised after the fact) needs 500g. But I have to say, this recipe was brilliant and I didn’t really feel that more asparagus would’ve added much. One thing I will say, though, is that the recipe says it serves 4 and I found this only yielded 2 decent portions. I had expected this soup to be tasty but I was so surprised how deep the flavours were for something made in about half an hour. Really, really full of flavour, and if I’d have been served this in a restaurant I would have been really pleased! KB rating 9/10. PR rating 8/10. Melt the butter in a saucepan, add the leek, then cook for 5 mins until soft. Add the potatoes and stock, and then bring to the boil. Cover, then simmer gently for 15 mins until the potatoes are almost tender. Stir in the asparagus and tarragon, then cook for a further 3-5 minutes until the asparagus is al dente. Remove one-third of the soup and blend until smooth. 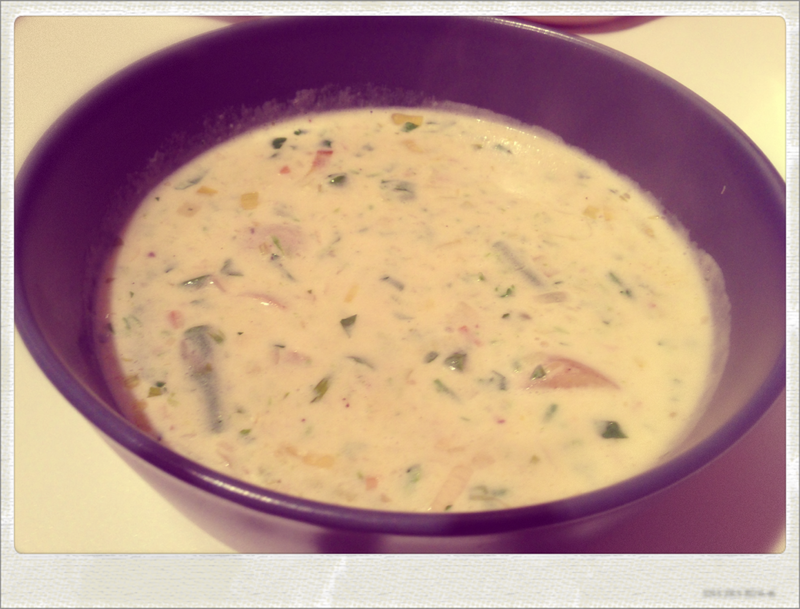 Return the blended soup to the pan, stir in the cream and parsley, then season to taste. Reheat gently for 3 minutes and serve. Categories: Reidbury Recipes, Vegetables | Tags: potatoes, soup, vegetarian, winter | Permalink.